George Jefferson "Jeff" Dwire (June 6, 1923 – August, 1974) was an Arkansas small businessman and the third husband of Virginia Clinton Kelley, and a stepfather of former U.S. President Bill Clinton and of Roger Clinton, Jr.. He was born in Bodcaw, Arkansas. A veteran of World War II, Dwire was injured during a parachute jump and had later worked as a carpenter. He had worked his way through college as a hairdresser. Other occupations and avocations included playing football, teaching judo, building homes, and selling oil-well equipment and securities. Dwire, who had three daughters from a previous marriage, met Kelley when she patronized the beauty salon he owned. They married on 3 January 1969 in Hope, Arkansas; the ceremony was performed by the Rev. 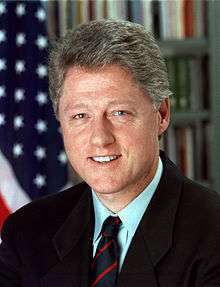 John Miles, and Bill Clinton served as the best man. He also played and sang at the reception. Earlier, in August, Clinton had watched the Chicago Democratic convention on television with Dwire. Family and friends of the bride discouraged the union because Dwire was an ex-convict, having served nine months in prison in 1962 for stock fraud. Hillary Clinton, then Hillary Rodham, described Dwire as a "supportive ally" in her attempts to forge a relationship with Bill Clinton's mother while Rodham was dating the future president. He also counseled Clinton concerning the draft, decisions involving which would become a major issue in his presidential campaign. Since Dwire and his new wife married later in life, the prospects of having children together were not favorable. At that time, Clarice Minner, their young babysitter and housekeeper, became pregnant with her second child. On October 12, 1969, with Virginia Dwire at her side as the anesthesiologist, she gave birth to a little girl. She named her daughter "Jeffrey" Lynn Smith as a sign of adoration to the couple. Dwire died in August 1974 of complications of diabetes. A 1967 Ford Mustang that he bought played a role in the 1992 presidential campaign and was a favorite nostalgia item of Bill Clinton. It is currently on display at the Museum of Automobiles in Arkansas. The Clinton family's housekeeper at the time Clarice Minner Hay, who was expecting a child, had so much admiration for the family that she named her daughter after Jeff. Her child subsequently became Jeffery Lynn Smith. Jeffery went missing three weeks before Christmas in 1985 while walking home from school in Hot Springs, Arkansas. She was 15 years old. ↑ Emily Toth, "Bringing up Billy: Review of Leading with My Heart: My Life," The Women's Review of Books XII.I (October 1994): 27. ↑ "The Clinton Family Bio," cnn.com. ↑ "Cliffs Notes For Clinton's Book: The Ultimate Abridgement Of My Life," CBS News (July 7, 2004). ↑ fullon, When Was Bill Clinton's Mother Born And Can You Tell Me A Bit About Her? (10 May 2007). ↑ "1967 Ford Mustang Owned by President Bill Clinton," RemarkableCars.com (Sun November 26, 2006). ↑ Jehl, Douglas (April 18, 1994). "A Mustang And a Boy Named Bill". New York Times. Retrieved 2008-03-02. Mr. Clinton's car, with its white interior, simulated side vents, automatic transmission and a six-cylinder 120 horsepower (89 kW) engine, was bought in 1972 by his stepfather, Jeff Dwire, as a gift for the President's younger brother, Roger, who was 16, but Mr. Clinton bought it from his brother several years later. ↑ "Missing: Jeffery Lynn Smith". National Center For Missing & Exploited Children - MissingKids.org. December 4, 1985. Retrieved April 11, 2016.